I’m sneaking in one last finish for 2014. Sinta and Sherri have hosted Another Year of Schnibbles over the last few years and I have really enjoyed working on the smaller quilts. Although this isn’t actually a Schnibble it is a small and quick mini quilt for December’s choice. The pattern is Shine by Sherri McConnell. I used aqua, blue and green batik fabrics from my stash and am quite pleased with the end result. Be sure to check out both blogs tomorrow for the monthly Parade of Schnibbles. I added the little corner pieces to the back so that it can be hung. I’m wishing everyone a wonderful new year filled with health, happiness and creativity. The beds need changing, the bathrooms need scrubbing and the laundry needs to be done, but today is going to be a day to rest. After all….it is Sunday. Christmas was wonderful and exciting around here and now is the time to sit back, enjoy the Christmas music and be thrilled by the peace in this Christmas season. Our gang all gathered on Christmas Eve. Things are always unpredictable with a large family and we ended up with one little grandson in the E.R. with an asthma attack. He was released Christmas morning and able to celebrate at home with his family. This was taken before he got so ill. The best gift of all was this great gathering the children did for us of the grandchildren. Updated photos of the kids are the only thing that I ever want and this is perfect. So…..today I have been relaxing with a little hand stitching. I really enjoy the counted cross stitch and hope to do more of it in 2015. Having the right tools for the job always makes such a difference. In the past I have used a circular hoop for my stitching and have recently been introduced to a different framing device – a Q Snap frame. It holds the fabric so much tighter than my old system and doesn’t leave a “ring” marking. I am stitching on DMC Laguna 28 and love the way the design is stitching out. I am finding that the eyes are not what they used to be and I think I need to invest in a magnifying glass that will attach to my nifty little light. Another new to me little device is this great magnet to mark my spot. Madam Samm makes them and they are great also for holding your needle and scissors when not in use as the magnet is incredibly strong. The finished project is going to be part of the Tammy Bag blog hop in January so you will have to stick around to see what becomes of my slow stitching. I’ll close here and get back to stitching after I share two pictures from our Christmas celebration. The first is of the youngest grandbaby and my mom together. The older kids exchange gifts with each other and I had to chuckle with this outfit that was gifted. Since it is also his school colors we were all daring him to try wearing it to school. I have been so negligent of this blog lately, but I wanted to take a moment to wish everyone a wonderful Christmas. We will have family arriving tomorrow and my computer will be quiet for awhile as we celebrate with our family and friends. In an effort to catch up a wee bit, I have had some exciting mail arriving in my mailbox. First off was this delightful postcard from Linda. We participated in the postcard swap that Sheila sponsored. Her quilting on it is just wonderful and my little ones here love it. I also had a couple of really nice wins lately. 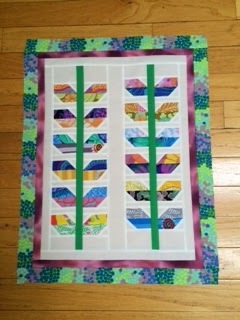 The first was from Carol of Just Let Me Quilt. Look at these beautiful fabrics, folded in a Christmas star pattern – so clever. Included in the package was a fabulous antique spool. These have always fascinated me and I have a very small collection of them. Needless to say, I was thrilled. Nancy at Victorian Motto Sampler Shoppe has had a daily giveaway for Christmas and I was lucky enough to be selected as one of the winners. She has such gorgeous hand dyed fabrics, floss and supplies for stitching. Look at these stunning colors of floss. 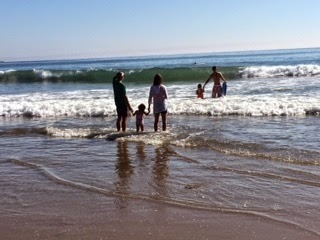 Last weekend DH and I took off to the beach for a couple of days before the busy week. We enjoyed sitting on the beach watching the gorgeous sunrises and sunsets as we admired God’s color palette. It was such a nice break from all of the busyness to relax and contemplate the real meaning of the season. In closing, I wish everyone a safe and blessed Christmas. It will be 2015 before we know it. Nine more days! Wow. How quickly the time is going. I’m starting to feel as though I am almost ready. The Christmas events have been keeping us delightfully busy. It is such a great time of the year – especially when seen through the eyes of the little ones. There is such magic to the season. A lighted white horse drawn carriage ride to view the Christmas decorations started off our celebrations. The sewing moments were short, but I did manage to get a coaster set made in between the busyness. I used the “B” from the Temecula Mini ABC quilt. The next night was the school concert. Every child in the school takes part in the musical – from kindergarten through 12th grade. The music is amazing! This is the high school. They are so professional by this age. I guess it can get a little tiring for a three year old!!! In between we have also celebrated birthdays - a busy month for us. Over the years I have followed Thearica at her Pigtales and Quilts blog. She now has a new blog found at www.stitchandquilt.com and she is having a wonderful giveaway to introduce people to her new blog. Be sure to go over and enter her giveaway. She recently made a great sewing machine caddy. I admired it and would you believe she sent it to me???? I love it as it keeps my tools under control and right at hand. The pincushion she sent matches the backing and it is such a generous size. We have enjoyed some welcomed rainy weather for the past few weeks. I know it has caused a lot of damage to our local burn area (Camarillo Springs), but everything around us is greening up so nicely. It is that luscious spring green that we have not seen in the last few years. Everything looks so clean and bright after such a good washing. I finally got my wrapping done. It is always such a relief to finish that task and know that I have accounted for each one of the children. The gifts spread out throughout the living room as we need to keep a clear path for the train under the tree. As we inch forward to Christmas, I hope we all can take the time to enjoy the wonderful beauty of the season. November really got away from me this year. Here we are on the last day of the month and getting ready to flip the calendar over tomorrow. The end of the month always means it is time for the AYOS Parade hosted by Sinta and Sherri. The pattern for the month was Mini Stems. I showed the completed top earlier this month. I managed to get it quilted and bound as well. I was trying to get a picture of it today, but it is a dark and rainy day here. Please pardon the washed out colors and shadows. We had a wonderful Thanksgiving here. The weather was perfect for everyone to be outside which is always a blessing when there are so many people here. You won’t hear me complain about the rain, but I was thankful that it held off until today. Our Thanksgiving will be different next year as these three will head off to colleges across the country and will not be home with us. They will all be missed. ......and now.....onwards to December………………. YIKES! I was really excited about finishing the table runner using the beautiful embroidery designs that I showed in my last post. Sunday was a quiet day around here and I was able to spend the afternoon working on the project. It’s hard to get the real colors to show, but I just love the depth that doing the trapunto outline on the designs makes. These designs can be found at patsy@patsythompsondesigns.com if you are interested in sewing some out. I can tell you that they stitch out beautifully….and quickly. I'm linking this up to Linky Tuesday at Freemotion by the River. In just one short week, many of our homes will be filled with the smell of turkey cooking. It is a great time of the year, but I must say that I enjoy the leftovers more. I suppose it might be that we are too busy entertaining to think about enjoying the food. With Thanksgiving being so late this year, Christmas will be right behind. I managed to finish the latest Christmas stocking this week. When I do the cross stich stockings I like to use a fusible interfacing on the back to make sure that all of those stitches will stay in place over the years of use. As well, I like to line my Christmas stockings. Since this one had such a vintage feel to it, I found a fabric that also had a vintage feel to it. This past week Kelly at I Have a Notion had a blog hop featuring Patsy Thompson’s embroidery designs. Kelly was doing the most beautiful table runner. Well…..I won the designs in her hop and I have been playing with them. I have stitched these out on silk and I love the way they have stitched out. The colors are a bit off, but I hope to get a better picture of them once I get the piece finished. Aren’t the feathers stunning? My mom, sister and I went to visit the Reagan Library this week. They have a couple of new displays going on right now, one being famous cars from films, presidents and Heads of State. It was fun to see them up close. Here are a few of them. The other display was California Christmas Trees. These were fabulous. They reflected all of the different areas of California. Each was so unique and fun. The room was a little dark for pictures, but this is one of them. Love the surfboard! In my quest to quilt my stack of finished tops, I have managed to get one more off the pile this week. The pile, however, still remains tall. The weeks just keep ticking away here with the holidays quickly creeping up on us. It's hard to imagine. There is still so much to do. 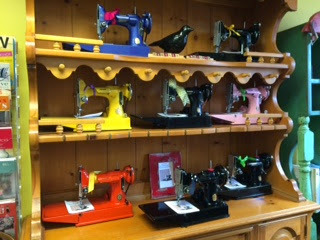 When that overwhelming feeling takes over I like to head off to my secret corner of the house and sew. It doesn't get the preparations done, but it makes me more relaxed! This week I managed to get the Mini Stems quilt top pieced. I love how this turned out and it is the perfect size for a nice wallhanging. 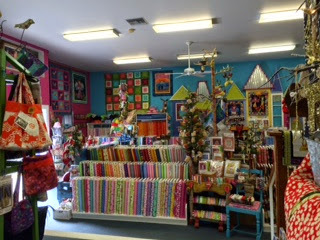 I needed a border fabric and was close to a great quilt shop in Carpenteria, CA - Roxannes. It was highlighted in the Quilt Sampler spring/summer issue. It's a fabulous shop and has a lot more than quilting. One thing they carry are Featherweight machines in GREAT colors. Hmmm....what color would you choose? They even have gorgeous hand painted ones...stunning! 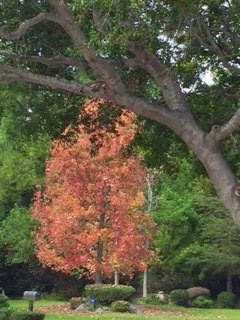 I know that winter has hit early in so many places, but we are enjoying some fall colors in our area. We don't have a lot of changing colors here so we really enjoy the trees and vines that do put on a display for us. This is our neighbor's tree that we look out on. 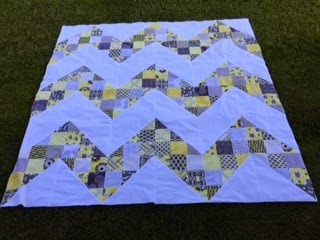 I played around with some charm squares and a Moda Bakeshop Chevron pattern. It worked up quickly and ended up a good size - about 80" square. The colors are citron and gray with a white background, but the sun was setting when I took this picture. Onwards with the week. Enjoy it. I don’t know about the rest of you, but I am having a heck of a time with the time change this year. I can’t sleep past 4:30 in the morning! That’s a full hour before the coffee turns on!!! As well, I’ve been fighting a seasonal cold that seems to be lingering on far too long. Stitching has been slow this week. I’ve been catching up on my little letters – a freebie at Temecula Quilt Company. Two more rows and the alphabet will be complete. One of the granddaughters wanted a nun’s habit for her saint’s speech at school. I had fun creating this one. I FINALLY finished my D4P quilt. I put flannel on the back so it will be soft and cuddly for the winter months. Most of my slow stitching this week has taken the form of counted cross stitch. I am trying to get this stocking done for Christmas this year. The kids and grandkids were all here for Halloween. I loved this picture of two of the little ones. It makes me wonder what was going through his mind. Have you entered the giveaway to win Wendy Sheppard's new book on my last post? Please be sure to check it out if you haven't already done so.